4SCU20LX High-Efficiency Variable-Capacity Air Conditioner High-Efficiency Variable-Capacity Air Conditioner The 4SCU20LX variable-capacity air conditioner is the perfect example of how AirEase® builds equipment that performs at its best, and is best suited to your needs. The 4SCU20LX means you get an indoor environment that’s everything you expect and more, without wasting energy. In fact, when compared to standard air conditioners, the 4SCU20LX can save you up to 50% on energy*, while keeping your temperatures and humidity just where you want them. 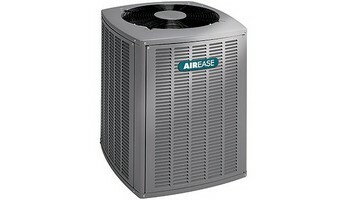 4SCU18LS AirEase ® is about making your life more comfortable, and exceeding your expectations. The 4SCU18LS does both.With its ability to adapt to cooling demands, the 4SCU18LS is a smart choice for any climate. Its cooling performance and efficiency make it a smart choice for any customer. We think you deserve more for your money. That’s why the 4SCU18LS is built well, built smart and Built for Life. Yours. High-Efficiency Two-Stage Air Conditioner Two-stage cooling allows the 4SCU16LS to adapt its output to match demand, so your temperature stays exactly where you set it. Two-stage cooling also helps the 4SCU16LS save energy, because it can run at a lower, more efficient speed most of the time and ramp up cooling output as needed for the hottest days. By adjusting its cooling output, the 4SCU16LS can even give you greater control over humidity, to preserve the quality of your air. It’s the air conditioner built to offer more. Because it’s built for life. Yours. Pair this model with a Pro Series™ variable speed furnace and a Comfort Sync thermostat, for optimum performance. With the Pro Series, you’re in control of every aspect of your home’s climate, as well as your energy costs. Pro Series Systems | AirEase | Home HVAC,The two-stage scroll compressor will run longer, gentler cooling cycles at low capacity during mild weather and switch to full capacity on hotter days, keeping you comfortable all season long.